Don’t they just look yummy?! I’ve been wanting to make tots for a long time. One of my guilty pleasures, and I have many, is tater tots with cheese Wiz. 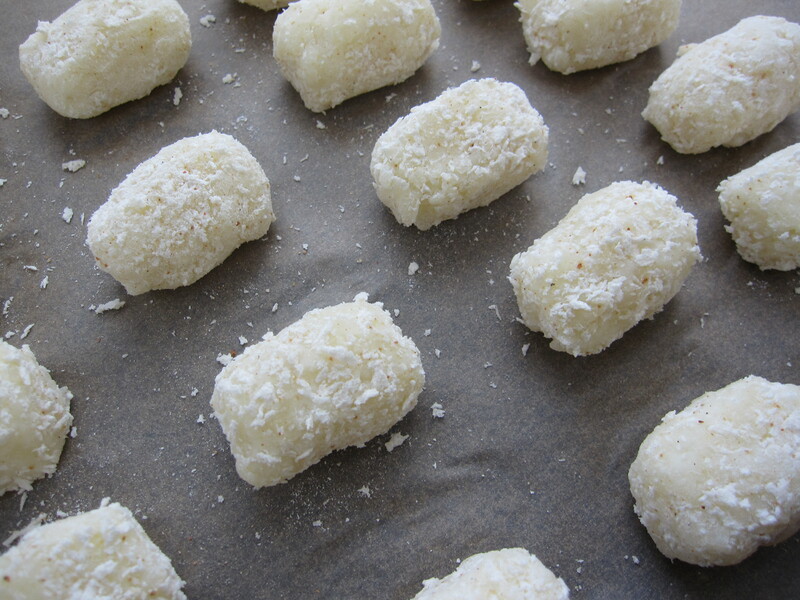 I know how easy it is to open a bag of frozen tots, but these are so worth the time! The potatoes I used for these were really small so I’m guessing it would be equivalent to 2 large potatoes. Peel potatoes and place in a large pot with enough water to cover them. If you using large potatoes, cut them in half before placing in the water. Cook potatoes over medium heat 20 min until potatoes are tender but not cooked all the way thru. If using small potatoes, remove all but one from pot and if using large potatoes, remove, all but a half. Set aside the potatoes you removed and let cool slightly. Let the remaining potato cook an additional 10-15 min until it is cooked thru and tender. While that potato is cooking shred the other potatoes you removed earlier. 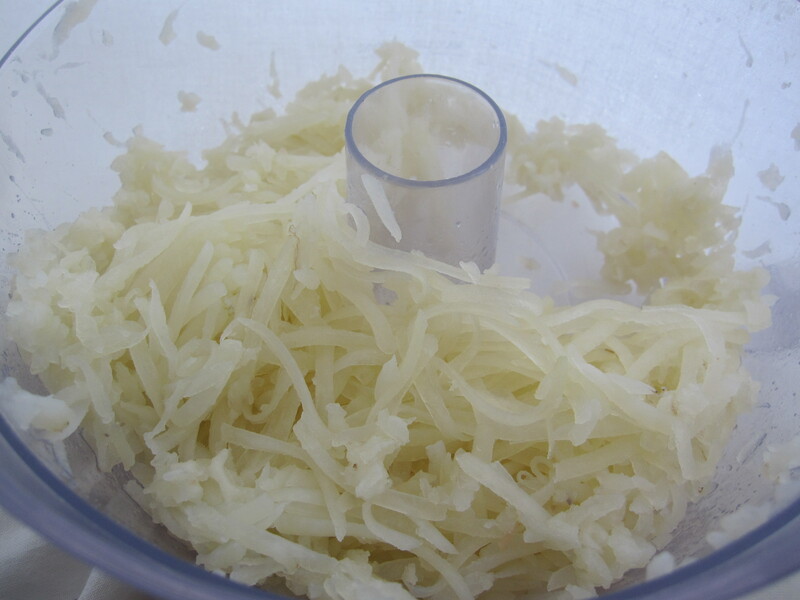 I used my food processor, but you can grate them by hand if you don’t have one. In a shallow dish add panko, flour, and season salt. Shape potato mixture to resemble a tater tot and dredge into flour mixture. I ended up with about 20 tots. Refrigerate tots for at least an hour. Now it’s time time to fry them. You can you use your deep fryer if you like, or just a pot with at least enough oil to cover the tots half way. Oil should be about 350 degrees. 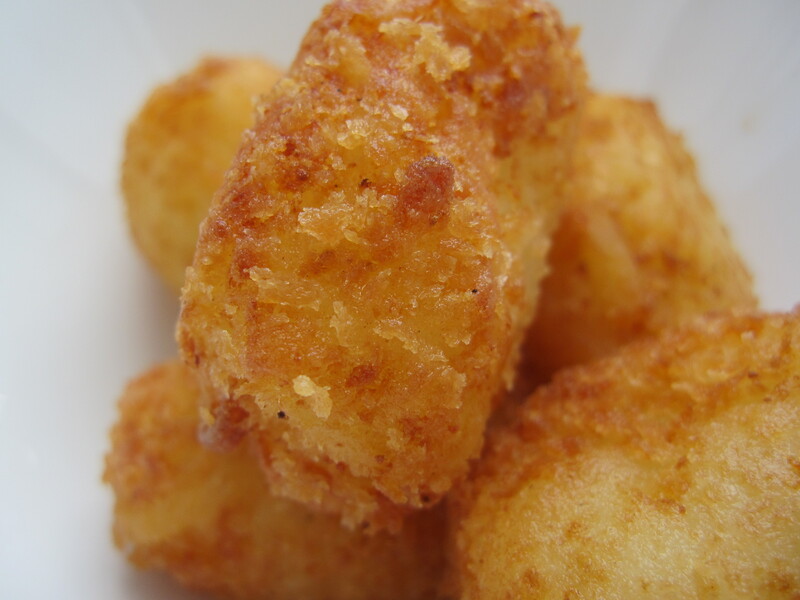 Fry tots for about 5 minutes or until they are golden brown. If you are using a pot make sure to turn tots over to ensure even browning. Drain on paper towel and serve with blue cheese sauce. Melt butter in a small sauce pan and add garlic. Add flour and stir constantly for about a minute. 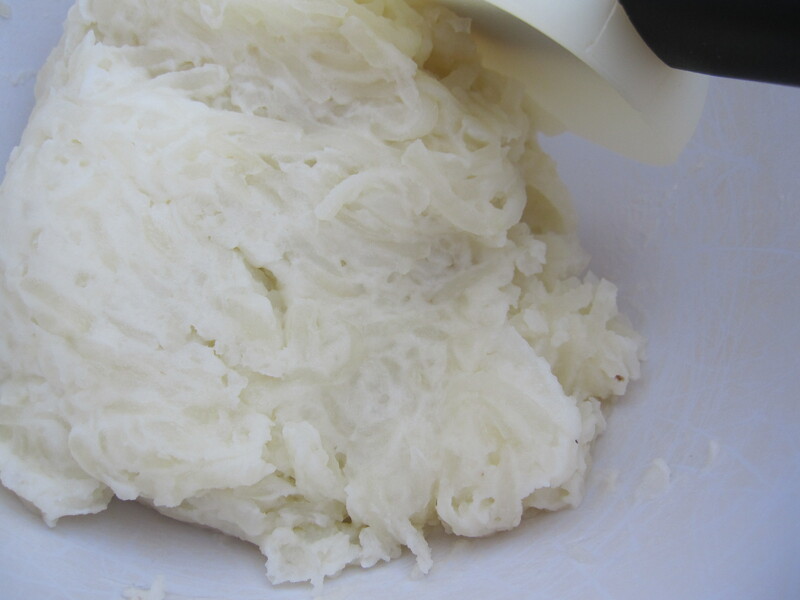 Slowly add cream and continue to stir until sauce and smooth. Remove from heat and add blue cheese. These were really good with the blue cheese, but you can definitely substitute the blue cheese with any cheese you like. I think a little parmesan mixed into the tots would be great too. So much you can do with these tots. Enjoy! Awesome!!! I cannot wait to make these! 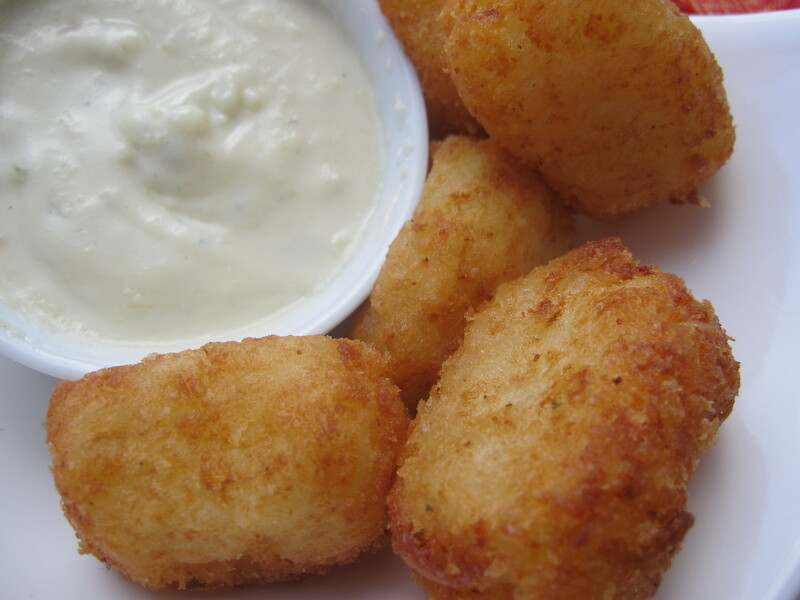 I love tots!! Thanks for sharing! I love tots too! I hope you get a chance to make them! Those look GREAT! I must try this recipe! Im in trouble now! YUM!!! I should stay away from this recipe, but what fun would that be?! Yum! Can they be frozen and then fried? They would be the perfect item to keep on hand in the freezer for a quick meal. Heck yeah, girl! These look awesome. And I abhor the food processor; thanks for putting the grate option out there. I never made my own taters! This is amazing! I always wondered how to make tater tots! Thanks for the post!